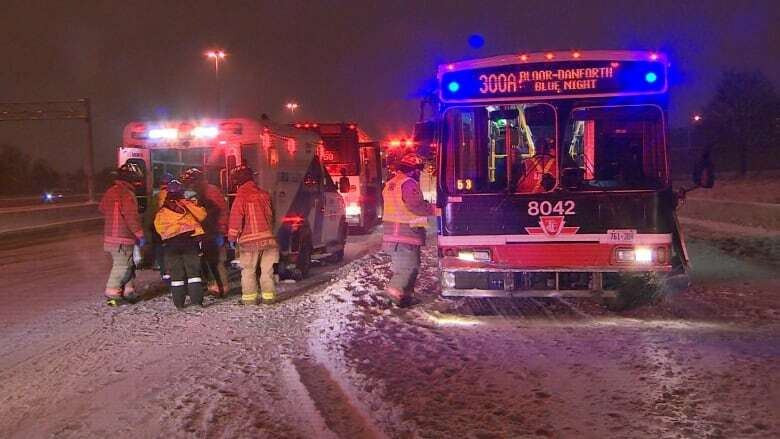 Five people were taken to hospital with minor injuries after a TTC bus headed to Pearson airport crashed into the guard rail on Highway 427 overnight. The single-vehicle collision happened just before 3:30 a.m. on the highway near Rathburn Road. The bus was significantly damaged in the crash and lost a bumper. Toronto paramedics say they transported five patients to hospital with minor injuries, including the bus driver. On scene some of the injured passengers asked firefighters to call Air Canada to say that they would be missing their flight to Orlando. Paramedics say the crash was likely the result of weather conditions. A winter-like storm hit the city overnight. Toronto police are reporting at least 100 collisions in the city since the snow started to fall around 5 p.m. on Sunday. Const. Clint Stibbe says the crashes consisted of fender benders and some minor injuries. The TTC says they're still working on the full damage assessment from the collision but confirm that the bus sustained "major damage," which amounts to anything over $2000.